Combating climate change by expansion of wind power, revolutionization of the automotive market by introduction of electric mobility or modernization of the aircraft fleet: all of these path-breaking projects are dependent on the use of modern materials. Lightweight yet high-performing composites allow for the reduction of weight of components - and thus for saving energy. The present study examines the global market for carbon fiber reinforced plastics (CFRP) and glass fiber reinforced plastics (GFRP). Especially the excellent weight / carrying capacity ratio makes CFRP attractive for many applications. The analysts of Ceresana expect the global market for CFRP and GFRP to increase to a volume of over 9.98 million tonnes by 2024. 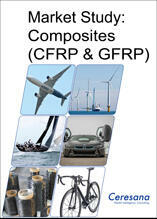 The study also analyzes the individual markets for both materials in detail and offers separate data for CFRP and GFRP. After the climate conference of Paris in December 2015, the follow-up conference in Marrakech in November 2016 did not come up with essential news: The climate targets of Paris were affirmed and unity was demonstrated. Without a reduction of the CO2 emission during energy supply, an effective climate protection can hardly be reached according to the summit. Wind energy continues to be one of the most important instruments in the change towards non-fossil energy sources. More and more countries - and not only developed industrial nations of the western hemisphere - invest massively in the expansion of wind energy. If the location is well-suited, increasingly larger and more powerful wind turbines with increasingly larger rotor blades are installed. The enlargement of the length of the rotor blades is made possible by the increased application of CFRP. However, cost is rising disproportionately with the use of CFRP for rotor blades which sets limits for the growth potential of wind turbines from a financial point of view. In any case, the number of installed wind turbines is increasing further in most countries. The market for GFRP benefits from this development as well since they are also applied in the production of rotor blades. Composite materials are used both in civil as well as in military aerospace industries. Yet, the majority is currently accounted for by civil aerospace. Global aviation and thus the demand for new civil airplanes will presumably continue to increase considerably in the upcoming years. Especially the regions Asia-Pacific, Latin America, Africa, and the Middle East register the highest growth rates. In regard to the demand for composites in the segment aerospace, the two globally largest aircraft manufacturers Boeing and Airbus play a major role. The new models of Airbus and Boeing have a significantly higher share of composites than older models. Especially the models Boeing 777, Boeing 787 (Dreamliner), Airbus A380, and Airbus A350 have a large impact on the market. CFRP are mainly utilized in fuselage and wings. Accordingly, the majority of the global demand in this segment is accounted for by the large West European countries (Airbus) and the USA (Boeing). Additional important airplane manufacturers like Bombardier (Canada) or Embraer (Brazil) ensure an increasing demand at the corresponding production sites. The Chinese manufacturer COMAC (Commercial Aircraft Corporation of China) has announced the maiden flight of its C919 for the first quarter of 2017. With a delay of several years, the production of the over 550 pre-orders can thus be started in the foreseeable future. At first, about 35 planes of the C919 type can be produced every year. This number is to be increased to over 100 units per year in the upcoming years. Lightweight construction will play a major role in the context of e-mobility in the automotive sector in the upcoming years: Heavy materials such as steel, other metals or engineering plastics are increasingly replaced by composites with low weight. In the segment of series production of cars, GFRP are preliminarily used. CFRP parts are still too expensive in most cases, at the same time, a suitable processing technology is still missing which would be up to the high standardization and production speed in the manufacture of cars. Furthermore, many segments lack suitable testing processes for series production which do not damage the products (Non Destructive Testing (NDT) processes). A promising processing technology in the automotive industry is Resin Transfer Molding (RTM), a resin injection process. In this process, preforms made of continuous fibers are prefabricated; afterwards, the resin is injected into them in a press form. After curing, the finished component is ready for processing. With this process, shortened cycle times of only a few minutes can be reached already today. Chapter 1 provides an analysis of the global market for composites, including forecasts up to 2024. Data on demand and revenues are analyzed for the six regions Western Europe, Eastern Europe, North America, South America, Asia-Pacific, and the Middle East and Africa. Chapter 2 provides market data for the 16 most important countries, that is, country-specific information on demand for CRP and GRP (in tonnes) and revenues generated with CFRP and GFRP (in billion USD and billion EUR). Additionally, demand is split by several application areas in detail. Chapter 3 demonstrates the regional distribution of the demand in the particular application areas. Market development in the segments wind energy, automotive, sports & leisure, aerospace, construction industry, electrical & electronics, and the category other applications. Market data is given in tonnes. Chapter 4 takes a look at the demand for the particular products, i.e. CFRP and GFRP. On a national level, revenues generated with CFRP and GFRP are also shown. Chapter 5 provides profiles of the largest manufacturers in the composite sector – clearly arranged according to contact details, turnover, profit, product range, production sites, and profile summary. Extensive profiles of 72 manufacturers are given, e.g. Compagnie de Saint-Gobain S.A., Formosa Plastics Group, General Electric Company, Hanwha Group, Honeywell International Inc, Owens Corning, PPG Industries Inc., Saudi Basic Industries Corp. (SABIC), Toray Industries Inc., and Teijin Ltd.